Read our tips on how to drive in heavy rain, considering what to do before you set off and on the road. There are few things more frightening for drivers than to suddenly face a blanket of fog. Your vision becomes compromised and those around you become instantly invisible. The good is, you can learn how to drive in fog. However good your driving, you can’t account for other people’s behaviour. But you can improve your chances of staying safe. First of all, ask yourself “is this journey absolutely essential?” If you’re aware that fog is a risk, the safest thing to do is to avoid it altogether. Postpone your journey. The chances are that you’d get delayed in fog anyway, so is it really worth setting out? Obviously that only applies if you have an inkling that fog is a threat. Quite often it can appear as if from nowhere – so you need to make sure you know how to drive in fog. That starts before you leave. 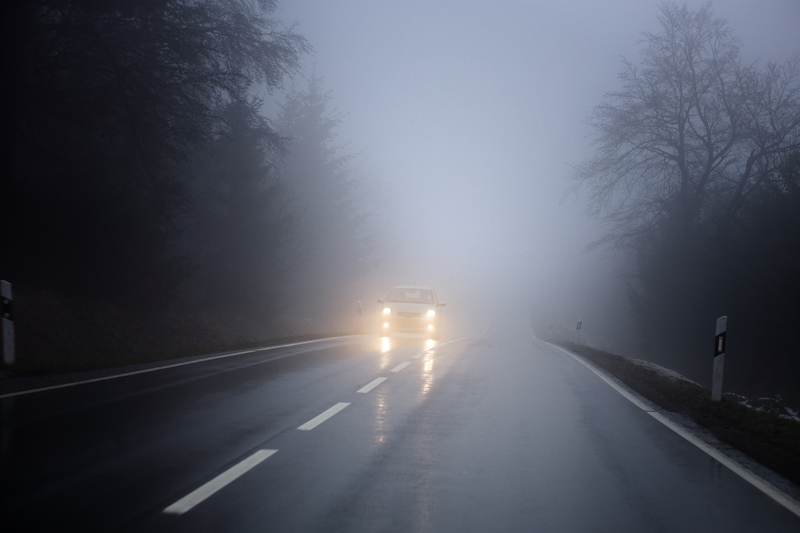 Your lights will take on huge importance when driving in mist and fog. So, before you set off, check that they’re all working and that their lenses are clean. Also, if you don’t know already, familiarise yourself with where your light switches are, including your fog lamp, and how you switch them on and off. Nowadays a lot of cars switch their lights on automatically when it gets dark but not necessarily in fog or mist. You therefore need to know how to control your lights manually. When you hit a patch of fog you should switch your headlights on and keep your beam dipped. It can be very tempting to put your lights on to main beam but this is the wrong thing to do. Your lights will actually reflect on the fog and reduce, rather than improve, your visibility. Driving with your main beam on can also dazzle oncoming traffic. The other misconception about driving in fog is that you should put your fog lights on at the first sign of mist. In fact, this can be a huge distraction to cars behind you. Don’t switch them on until visibility has dropped below 100m. A quick guide is to check if you can see the bumper of the car in front of you. If you can, keep your fog lights off. If you can’t, it’s time to switch them on. Some cars are fitted with front fog lights. If you’re going to use them, the same rules apply as rear fog lights. Your fog lights will only work when your headlights are on dipped beam. Remember, fog lamps emit an extremely strong light and they can be a hazard to other traffic if used inappropriately. Whenever the fog lifts – even temporarily – switch your fog lamps off immediately. Pay attention to what’s happening inside your car. Fog can cause condensation which builds up on windows, further obscuring your view. Turn on your windscreen and rear windscreen heaters to demist your windows. It can be a good idea to open your windows slightly too. Not only will this help with the condensation but it will allow you to hear what’s going on around you and will help fill in some of the pieces that your lack of visibility has taken away. For the same reason, we suggest you turn your radio off. Stopping distances become even more important in fog as drivers are likely to brake suddenly. Whilst it’s tempting to drive close to the car in front, to give yourself a sense of where you are, you risk colliding with them if they brake without warning. Equally, if you feel the car behind you is uncomfortably close, it is better to pull over and let them pass than risk your own safety. Keep an eye on your speed. Without context, it can be easy for you to lose sight of how fast you are driving. Keep an even, steady speed – slower than usual but not dangerously slow – and be aware that stationary objects could appear in your path at any moment. Finally, be aware of the temperature. Fog and mist will create a light damp layer on the road surface. If the temperature drops, this could form ice so be extra careful in foggy, cold weather.